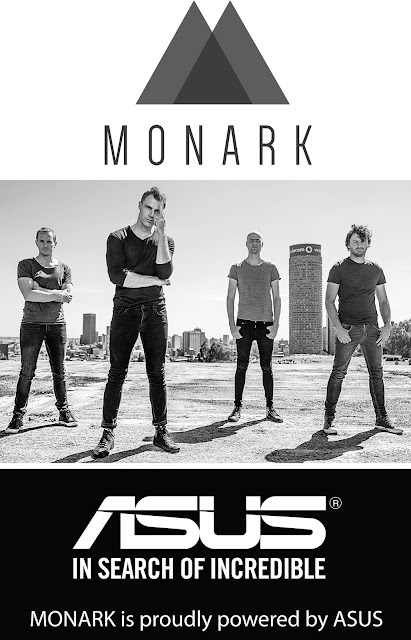 Hardware manufacturer, ASUS South Africa is excited to officially announce their partnership with the popular South African Band, Monark. “ASUS is excited to partner with Monark. We both strive to be fresh, unique and deliver quality in all aspects. Monark delivers something completely fresh and unique, and is setting trends sonically and stirring up tastes in the South African music landscape. This will be the first time that ASUS South Africa enters the music market with regards to a sponsorship as they are mostly known for their lifestyle, sport and gaming sponsorships. “It is important to us that the Monark brand aligns itself to a partner that complements our style and type of music. ASUS and Monark aligns perfectly as we are both focussed on style and exceeding expectations that leave people feeling good. We are excited about this new chapter that we are sure will grow into a long-standing partnership for both brands,” commented Deon de Klerk, Bassist of Monark. “We are very specific with who we align with to make sure that they share our ethic and vision. ASUS have an incredibly fresh approach to how they adapt to the world’s technology trends while still retaining their own brand identity, which is the same way we view the music industry. We couldn’t be more excited to start this brand alliance”, Craig Reid, Manager of Monark added. Performing as a 4-piece band, Monark delivers a fresh and unique sound while setting trends sonically and stirring up tastes in the South African music landscape. Having dominated the South African airwaves with their first two singles, Smiling (5FM Top 3) and Build It Up (5FM Top 5, and #1 on Jacaranda FM, 947/ KFM, Algoa FM, OFM), they then released their 3rd single, Something, building up to the release of their debut album NEGATIVES. The album, which was released worldwide on 14 July 2014, peaked at No. 1 on the iTunes Album Chart on the day of its release. Their energetic and polished live performances have been incredibly well received by their fans, with Monark performing on some of the top stages in the country – including Rocking The Daisies, Durban Day, Kirstenbosch Gardens, Parklife, 94.7 Joburg Day, KFM 94.5’s KDAY, Splashy Fen, KKNK, Durban Botanical Gardens, to name but a few.